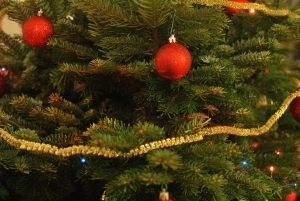 Is Your Christmas Tree Making You Ill? The fall allergy season, with its ragweed and other irritating pollens, is behind us. But the holidays can bring a whole host of new misery-makers for people with allergies. Look no further than your Christmas tree for a classic cause of allergies. Here’s a quick run-down of the pros and cons of Christmas tree options for allergy sufferers. The real thing. Fresh-cut trees can be coated in various pollens as well as molds that are common to conifers. They also contain terpene—a hydrocarbon found in the oil or sap of trees—that some people are allergic to. These same allergens can also be found on wreaths and garlands. To minimize these allergy risks, you can ask the tree vendor if they have a mechanical shaker. Many do, and this can help get rid of some of the pesky allergens coating your tree. They might also be able to hose your tree down (or you can do this at home on the driveway). Fruit and vegetable washes (available in the produce section of the supermarket) may also remove allergens. If you have a leaf blower, you could use it to blow away some of the pollens before you bring the tree indoors. And finally, make sure to wear gloves when touching the tree to avoid contact with allergy-causing terpene. Synthetic. Though artificial trees are not plagued by pollens from the forests or terpene from sap, they can pose their own challenges. If you store then in the attic, they may accumulate dust or mold. Before you set your tree up in the living room, consider taking it outdoors and giving it a good spray-down with a hose. And when you go to store it again, make sure it’s in an air-tight container. Some trees are made of PVC which can be bothersome for people with respiratory allergies (chronic cough, wheezing, asthma, etc.) Some newly manufactured trees are made of polyethylene instead and do not adversely affect the lungs like PVC does. If your tree continues to affect your health, try limiting the amount of time you have it on display (maybe just a week or two surrounding Christmas) or displaying it outside where you can see it through a window. You might also try “hypo-allergenic” tree options. Pinterest has some great ideas (search environmentally friendly trees for options). If your allergies persist, contact AllergyEasy for no-pain, no-hassle treatment with sublingual allergy drops. Allergy Easy > Allergy Information > Is Your Christmas Tree Making You Ill?